1. Military Medal of Merit (Nos. 1 and 2) was founded on the 23rd July, 1814, by Duke Frederick Francis, for the troops who had distinguished themselves in that memorable campaign. It is worn at the button-hole suspended by a ribbon of the ducal colours : bright blue with narrow borders of red and yellow, and is divided into two classes — the gold and silver medal. The front exhibits an antique sword in a perpendicular position, entwined by a laurel wreath with the year "1813" at the sides of it ; the reverse shows the inscription : "Mecklenburg's Streitern" (To Mecklenburg's warriors), and the initial of the founder. 2. 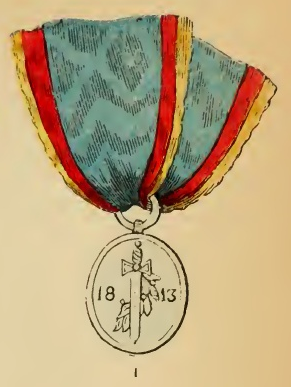 Civil Medal of Merit. It is rather larger than the previous, and bears on the front the effigy of the founder with the legend : "Friedrich Franz, Herzog zu Mecklenburg" (Frederick Francis, Duke of Mecklenburg). 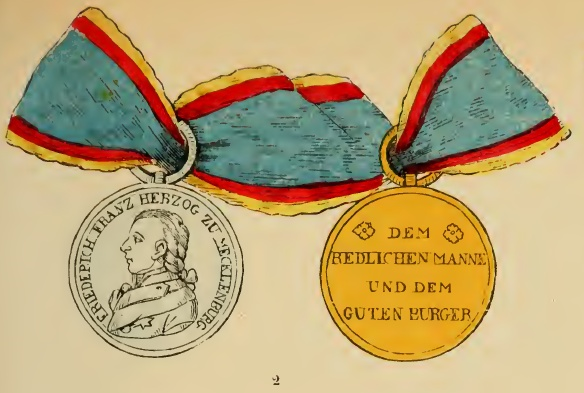 The reverse shows the words : "Dem redlichen Manne, und dem guten Burger" (To the honest man and good citizen). It is presented either in gold or silver, and is worn by a ribbon of the same colour as the previous military medal (No. 3). 3. The Military Cross of Service, (Nos. 4 to 6). 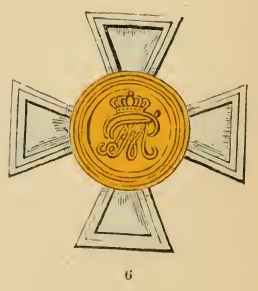 It was founded on the 30th April, 1841, by the Grand Duke Paul Frederick, and consists, for officers and officials of the same rank, of a gold cross, bearing in front the initial of the founder, and on the reverse the number of years of service. 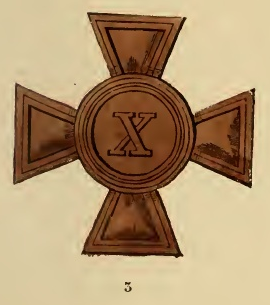 For sergeants and under, the decoration has four classes : a cross of silver with a gold middle for the first class : a cross of silver for the second class : a cross of copper with a silver middle for the third class : a cross of copper without middle for the fourth class. The front shows the initial of the founder, and the reverse, the years of service. The Military Cross of Service is worn on the left breast suspended by a crimson ribbon with blue and yellow borders. Officers and officials of a similar grade receive, after twentyfive years' service, the gold cross, while the number on the reverse is altered for every five years' additional active service. Military sergeants and those of inferior rank, receive, after ten years' active service, the fourth class cross ; after fifteen years, the third class cross ; after twenty years, the second class ; and after twenty-five years the first class cross ; also the number of the years on the reverse is altered after every five years' additional service. 4. The War Medal was founded on the 30th April, 1841, by the Grand Duke, after the form of the medal of the other German States, for the war of 1814. It is cast from heavy (gun) metal. The obverse shows the initial of the founder, and the year "1841", and the reverse, the inscription : "Für treuen Dienst im Kriege" (For faithful service in war). The name of the recipient is engraved on the edge ; it was distributed amongst the veterans who had served in the Rhinebund from 1808 to 1812, or made the campaigns of from 1812 to 1815. 5. 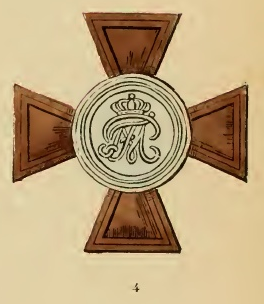 The Military Cross of Merity was founded on the 5th of August, 1848. It is also cast of heavy gun metal, and contains on the front the inscription : "Für Auszcichnung im Kriege" (For distinction in war), and on the reverse the initial of the founder, and the year "1848". It is worn on the left breast by a bright blue ribbon with narrow borders of red and yellow.